Demand for this product has finally resulted in another DVD. Follow Tim through a typical senior photo session in his studio. 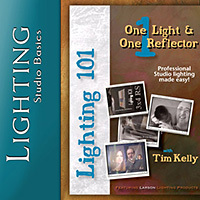 (Vol.1 is female subject only) With all of its clothing and background changes, Tim will instruct you in the Lighting, Posing and Design elements needed to create artistic portrait images of these young adult subjects. This IS a real senior, and this IS how he really does them.